No one can resist a tasty sandwich with peanut butter and jelly. 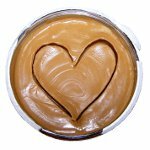 It's National Peanut Butter Lover's Day on March 1, so let's celebrate it. Peanut butter is a perfect addition to any snack. It goes well with everything: bananas, apples, chocolate, carrots, pretzels, crackers and much more. But the best one is a sandwich with tasty jelly and peanut butter. By the way, did you know that 96 % of people who make such sandwich put the peanut butter first and then jelly? An average American child eats about 1,500 peanut butter sandwiches before he or she graduates high school. That's a lot, isn't it? Actually almost every family in the U.S. has got a jar of peanut butter in the household. There are two kinds of peanut butter produced: chunky and smooth. Smooth peanut butter is popular in the East Coast, while chunky one is widespread in the West Coast. Children and women prefer smooth peanut butter, while men chose chunky one. No matter what kind of peanut butter you prefer, celebrate this day a delicious snack in honor of the occasion.